Let’s face it, I have everything I need. I am blessed with a great family, health, a good job, a roof over my head, more food than I can eat, money in the bank. I even live in a gorgeous locale, so I am set with everything. Ok, maybe everything except a hot international soccer star boyfriend, but at 50, I’m afraid I may have to settle for a “hot former international soccer star that we kind of remember from a long time ago boyfriend.” I’ll get working on that. ANYWAY…what I’m trying to say is that I don’t want presents. I don’t want cards. I don’t even want cake. What I want is for the world to be a little more of a kind and generous place, and if my birthday can be the catalyst for that, that would bring me so much joy. SO. Here’s the plan: each day, for the next 50 days, I will feature one worthwhile organization that is doing good works. I want my gift to be to open up this space to these organizations and see what happens. I’d like for people to pick one or several and get involved, either by donating, volunteering or taking action. I’ll give information about the organization, a donation link, and, if I can, a way to take action other than through a monetary donation. If you are so inspired, take action and leave me a comment letting me know you did it. Even if you don’t act now, please keep some of these organizations in mind for when your ship comes in (and I know it will. I can see it on the horizon right now) or for when you have time. And don’t worry – regular posts will be sprinkled in too, so don’t give up. You’ll get your usual dose of fine, high-quality Suebobian blather and bluster. You honor me by stopping by to read this blog. Thank you for your time and attention over the past few years. And thanks for sharing my birthday celebration with me. The party starts tomorrow. Be there! LOTS of things…I tried to spread it out. Cool. I turned 50 a few months ago, and didn’t want a party or a lot of presents, so I set up two projects on Crowdrise and emailed everyone I know. Crowdrise is kind of cool – maybe it’s something that you could use? What a great idea. I’ll definitely be watching. And on the hot former soccer star front, I suggest Zidane. Mmmm….Zidane. It certainly won’t be Maradona! What a great plan. And I have a feeling you will never be old! But can I take you out to lunch for your birthday? I work from home on Fridays now. If I am in town, definitely. Or at least in my birthday month! 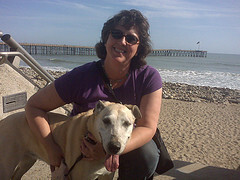 Donated to a dog rescue on my lunch break & thought of you & Goldie before I read this post. Dog people are the best people, doncha think? What I really wanted to say is: HEY! Your birthday is the day before mine! I knew I liked you. July babies are cool. Happy Birthday, SueBob! I love this post and am thrilled we are walking the earth at the same time. I’m going to send you a separate email but I’ll be slapping this beautiful post on the front page of BlogHer’s LIFE section because you are just that awesome. How amazing are you?! Love this idea. No, how amazing are YOU? Thanks, Julie. As a fellow 1961 birthday girl- I just wanted to send my congrats and (hugs) for the inspiration! Amazing! 1961 was a very good year! Thank you. I think you rock. All I did on my 50th was drink a lot. Wonderful idea! I can’t drink that much without getting woogy, so here I am. I think you rock, too. Ooh, what fun! Great idea, Suebob — and you’re just the woman to make it happen! I’m enjoying it, but missing regular postings. I’m considering tagging some regular stuff on at the end of these posts. Or 2 posts a day? I dunno. Great idea! I’d go with the two posts a day if you have the need to say something. Pretty sure we won’t mind. My very favorite charity is The Advocacy for Patients with Chronic Illness http://www.advocacyforpatients.org/ Jennifer Jaff was all set to become a brilliant trail lawyer when she got sidelined by Crohn’s disease. So she made lemonade out of that lemon and now she does something that nobody in this country does…she provides free legal assistance to people with chronic illnesses who are being screwed by their employers and by their health insurance companies…among other things. She is one tough (and did I mention brilliant?) cookie and I think she is truly awe inspiring. There is no way that the federal government would have approved my disability retirement without Jennifer’s hard work. Thanks, I will take a look. I know the small non-profits have it much harder. Sarah and the Goon Squad » Suebob is What?